November 15, 2016 – DJI, the world leader in unmanned aerial technology, Tuesday introduced two new drones that raise the bar for professional imaging: Inspire 2, the best ready-to-fly platform for high-end film and video creators, and Phantom 4 Pro, the smartest and most creative flying camera of its size. Inspire 2 offers powerful capabilities and is easy to operate. The nimble new magnesium-aluminum alloy body increases stiffness while lowering weight. It has a top speed of 67 mph and takes only 4 seconds to accelerate to 50 mph. With the new dual battery system, flight time is up to 27 minutes. A new forward-facing camera offers the pilot the best flight view for operating the master controller, while the camera operator receives a separate feed from the professional Zenmuse camera mounted on the main gimbal. The Inspire 2 supports the brand-new Zenmuse X4S and X5S cameras and will support additional cameras in the future. An entirely new image processing system, called CineCore 2.0, is embedded into the airframe, which allows processing large files faster than ever before. Inspire 2 captures 5.2K video at 4.2 Gbps for Adobe CinemaDNG RAW videos and leverages a newly-designed, fast CINESSD storage for a smooth work experience. A variety of video compression formats are supported by CineCore 2.0, including Adobe CinemaDNG, Apple ProRes 422 HQ (5.2K, 4K) and ProRes 4444 XQ (4K), H.264, and H.265. When recording 4K video in H.264 and H.265, the birate is up to 100Mbps. Inspire 2 offers professional capability and control suitable for many scenarios. With optional high-altitude propellers, Inspire 2 can reach a maximum service ceiling of 16,404 feet above sea level, and the self-heating dual battery redundancy system maintains good performance of the battery to -4 degrees Fahrenheit. Through an optimized mode, Inspire 2 streams smooth video at the widely used 1080i50/720p60 broadcast standard. Enhanced Lightbridge video transmission makes smoother HDMI video possible. The dual-battery system ensures that if one battery fails during a flight, the other will be able to provide power for a safe return to home. Stereo vision sensors have been included on the front and bottom of Inspire 2 for obstacle detection, and upward facing infrared sensors on top of the aircraft add protection when flying in enclosed spaces. The redesigned propulsion system can safely carry Inspire 2 through incredible vertical camera moves, climbing at almost 20 feet/second and descending at almost 30 feet/second. Redundant systems provide reliability for the IMU, barometer, electronic speed controller communication and satellite navigation modules. The master and slave controller range now extends to 328 feet and users can switch between 2.4 GHz and 5.8 GHz frequencies to cut through any noise for greater signal stability. Inspire 2’s new intelligent flight modes expand DJI’s computer vision technology to safely fly routes that give creators new ways to capture what they envision. Spotlight Pro Mode locks onto a subject during flight while the aircraft flies freely in another direction – and automatically rotates the aircraft to stay on the shot if the gimbal reaches its rotational limit. The forward-facing camera offers TapFly, which directs Inspire 2 to any point on the screen while avoiding obstacles along the way. ActiveTrack recognizes common subjects such as people, cars and animals, sending Inspire 2 to follow behind, lead in front, circle above or track alongside while always flying forward, ensuring the forward-facing obstacle sensing system keeps the aircraft safe. DJI is enhancing the imaging potential of the Inspire 2 by expanding its line of interchangeable Zenmuse cameras, which are designed for aerial imaging and communicate directly with the aircraft’s gimbal and flight controllers. For situations that require a balance between weight and image quality, the new Zenmuse X4S has a 1-inch, 20-megapixel sensor with 11.6 stops of dynamic range and a 24 mm equivalent focal length. The Zenmuse X4S offers aperture control (f2.8-11) and a mechanical shutter that cancels rolling shutter distortion. The new Zenmuse X5S has a larger Micro Four Thirds sensor with 20.8 megapixels and an incredible 12.8 stops of dynamic range. The Zenmuse X5S camera now supports 8 lenses from wide angles to zooms. It shoots 20fps continuous burst DNG RAW (20.8 MP). In the future, a handheld mount will be available for the Zenmuse X4S and X5S cameras, bringing those cameras down to the ground for more flexible filmmaking. 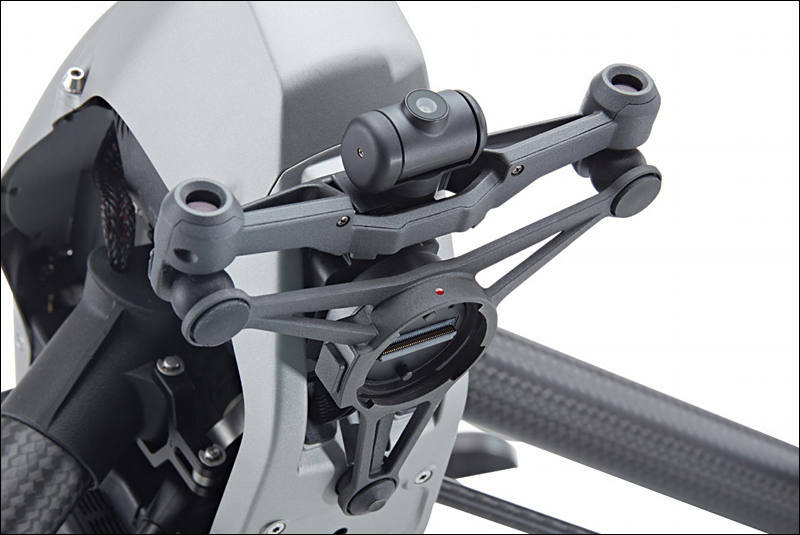 A series of powerful DJI accessories will meet the needs of operators under various filming conditions. DJI Focus, a battery charging station, DJI CINESSD, CINESSD station and other optional accessories are available. An optional DJI Crystalsky high-brightness IPS monitor features an ultra-bright screen that is clearly visible in direct sunlight and ideal for outdoor shooting. It comes in 5.5-inch and 7.85-inch sizes, with the highest brightness up to 1000 cd/m2 and 2000 cd/m2 respectively, and its dedicated system reduces video transmission latency. Dual Micro-SD Card slots within the screen make it easy to back up footage and can also be used to transfer and play back files. It operates in extreme temperature conditions from -4 degrees to 104 degrees Fahrenheit. Inspire 2 will have top speed of 58 mph instead of original 67 mph. And it'll take take five seconds to reach 50 mph instead four seconds as first indicated. i was thinking what other camera offers the same recording spec as this? Added support for the Zenmuse X7 gimbal and camera. CineCore 2.1 now features an updated camera processing system, which can support the new DJI movie color system (including D-Log curves and D-Gamut Color Space) when used with Zenmuse X5S and X7. Added new EI mode in Camera Settings, to make the camera operation style more compatible with other professional movie cameras. Please note that EI mode can only be turned on when both SD and SSD are enabled. Fixed a rare issue where the camera restarts when used with a Panasonic Lumix 14-42mm/3.5-5.6 HD automatic zoom lens. Fixed a rare issue where image edge is deformed when using the Zenmuse X5S with some Olympus-made lenses. Added an auto-focus function to both ActiveTrack and Spotlight modes. The camera will re-focus on the target when the distance between the target and aircraft changes. Fixed a rare issue where aircraft acceleration slows down in TapFly mode. Optimized gimbal yaw smoothness in Follow Mode. Added gimbal pitch auto return to center in Landing Mode to avoid the gimbal touching the ground. Added a remote controller customizable button to control gimbal pitch and pan rotating to center simultaneously. Latest remote controller firmware and DJI GO 4 versions are required. Added DJI Goggles Head Tracking Flight and Head Tracking Gimbal. Fixed an issue where the slave remote controller cannot control the gimbal when using both regular and Cendence remote controllers to work as master and slave.